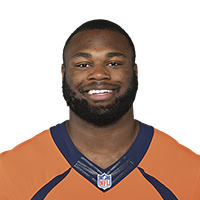 Published: Nov. 18, 2018 at 06:25 p.m.
Denver Broncos running back Royce Freeman crashes up the middle for a 3-yard touchdown. Published: Oct. 18, 2018 at 10:00 p.m.
Denver Broncos running back Royce Freeman powers through the Arizona Cardinals defense for a 1-yard touchdown during Thursday Night Football of Week 7. Published: Oct. 1, 2018 at 09:16 p.m.
Denver Broncos running back Royce Freeman rushes past the Kansas City Chiefs defenders for a 14-yard touchdown. Published: Sept. 23, 2018 at 01:26 p.m.
Denver Broncos running back Royce Freeman receives the handoff, and cuts up the middle for a 6-yard touchdown.